Before you start looking for your ideal audio technology vendor, it’s important to understand the ins and outs of these solutions. After all, audio is perhaps the least understand part of audiovisual. 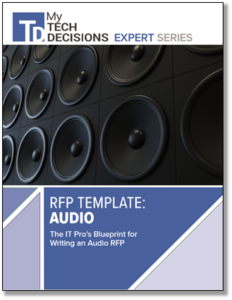 Our new guide “RFP Template: Audio” walks you through the basics of acoustics and audio components. Even more importantly, it provides 30 essential questions that you need to address when writing an audio request for proposal (RFP). Over the past year, our editors have been working with leading integrators and solution providers to better define the information needed for an effective request for proposal (RFP). Now is your chance to benefit from what we have learned and get your copy of the audio blueprint for IT pros.